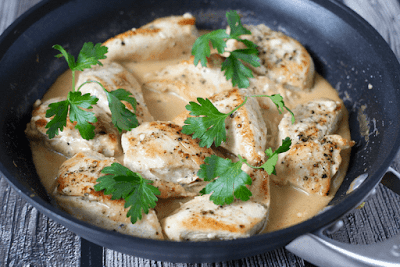 This creamy skillet chicken has a velvety smooth sauce from just 2 ingredients! Welcome to one of my favorite dinners. I’ve been making this easy creamy chicken for years. It started one of those nights when I looked into the fridge and wondered why I hadn’t gone to the store that day. Slim pickings. Then I spied some wedge cheese and some chicken I needed to cook and this delightful dinner was born. And ever since, it fails to amaze me. It’s the sauce. The sauce has a serious yummy quotient. It’s decadent but also, believe it, so very light. And it takes just two ingredients. Season chicken strips or chunks with salt and black pepper. Add chicken and sear on both sides until browned, about 2-3 minutes per side. Add cheese wedges and chicken broth, scraping up any stuck-on bits on the bottom of the pan. Reduce heat to medium-low and cook until the cheese has melted, the sauce has thickened and the chicken is cooked through, about 5 minutes. Serve chicken with extra sauce drizzled over the top. Devour!